Any child or adult who has ever seen Maurice Sendak illustrations can usually recognize his distinctive style from book to book. Maurice Sendak is an award-winning author and artist who has illustrated unforgettable images for many children's book favorites, including Where the Wild Things Are and In the Night Kitchen. Through different tales, Sendak's artwork retains a fantastic, whimsical quality that renders his pictures remarkably recognizable, whether he's drawing bears, wolves or monsters. Because he knew that many of his relatives perished during the Holocaust in World War II, it's been said that his awareness that the very young could die remained a preoccupation in his work and many of his illustrations are tributes to the Jewish people who died during the war. Where the Wild Things Are: This 1963 classic features monsters, whose images were inspired by Sendak's aunts and uncles. The book details the adventures of Max, whose mother sends him to his room without supper as a punishment. Max dons a wolf costume and meets many different mythical creatures, the "wild things." Long regarded as one of the best children's picture books, it won the Caldecott Metal in 1964. Higglety Pigglety Pop: A dog named Jeannie is loved, but she remains unhappy. She decides to leave home and gets the chance to be an actress. To be an actress, however, she needs experience and ends up having the kind of experiences that leave her quite disconcerted. In the Night Kitchen: This 1971 Caldecott Honor book is another classic about a boy named Mickey who has all kinds of whimsical adventures in the kitchen while the rest of the world sleeps. Little Bear series: These books were written by Else Holmelund Minarik, with illustrations provided by Sendak. They detail the adventures of Little Bear, his parents and his many friends in the forest. This is only a partial list, as Maurice Sendak illustrations can be found in many more books, some of which he authored, while others were written by someone else, but illustrated in his memorable hand. You may be a parent revisiting some of your childhood favorites and sharing them with your child, who's seeing these fantastical illustrations for the first time. 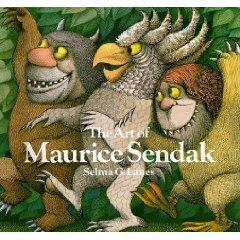 Because Maurice Sendak has been such a prolific illustrator, you'll undoubtedly see his work in many other books as well. It's not hard for grownups and children to see the whimsy and the fantasy in his illustrations, and to see the enduring appeal that his illustrations hold for many. Reading his stories and viewing his artwork is like entering another world, something all the best kids' stories make you feel.